In November 2007 Michael Grey was invited to join a Toronto Police Pipe Band deep in redevelopment mode. A great band with a long history of excellence (2012 marks the bandâ€™s centennial) the group was ready for a renewed approach to their music-making. Already one of the worldâ€™s most successful composers working in the idiom of the Great Highland Bagpipe, Grey enthusiastically took on the mantle of music director. Seven months later, the band’s first competitive performance at Georgetown, Ontario, and the premiere of their “Variations on a Theme of Good Intentions” created a firestorm of opinion across the pipe band world. A selection of music based on a single, seamless musical idea, “Variations on a Theme of Good Intentions” represented a way of competitive performance that polarized pipers and drummers. At once lauded for attempting a bold, new competitive musical course and derided for brazen harmony-laden attention-seeking the band’s music had the world listening. Each new year that followed saw the band take on the musical challenges set by Grey. And each new year saw passionate aficionados of pipe band music continue to pick their points, loving the music, hating the music and everything in between. This book contains that music, the band’s selections, complete with harmony lines and performance guidelines. 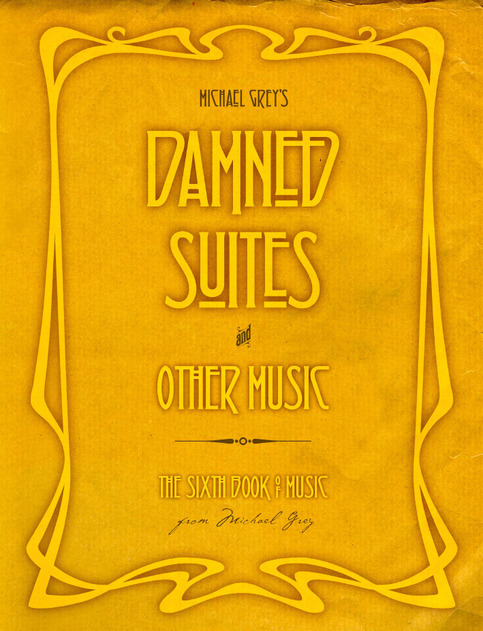 Michael Grey’s “Damned Suites and Other Music” marks his sixth collection and without doubt his most thought-provoking to date. An important achievement in the evolution of pipe music. Great job. I have over 500 books of pipe music [and books] about piping and this is by far the most attractive and visually interesting (to add to the music of course). I have known Michael since he was 16 years of age. He showed an uncanny facility for bagpipe music composition from that age onward. I shared with him the great fun of The Megantic Outlaw, The Immigrant’s Suite and so many of his more or less unconventional compositions. He is undoubtedly the most prolific composer of pipe music living today and his stuff crosses every boundary of pipe music. He can be a master of great traditional melodic tunes but he can also dazzle with completely unexpected flights away from the traditional piping composition format. This volume contains a great deal of that thinking, from creating medleys (or suites) from whole cloth to re-casting well known traditional tunes into a new and dare I say more hip format?….it’s all here. Anyone who treasures an inventive musical mind and adventure in piping should, must, have this book. Beautifully produced, lovely graphics, good stories; this is the product of a very fertile musical imagination. Get it. “Damned suites” c’est vraiment excellent bravo!!! It’s quite an astonishing production really — musically, visually. I would dare call it an artistic tour de force: very much the work of a mature MG. Well done and congratulations. It will go on the shelf with my more valuable music. 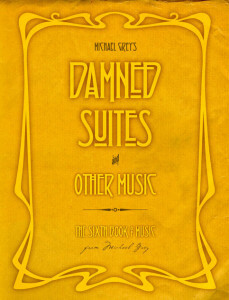 No music collection would be complete without this Book of Damned Suites; it’s an important edition, and even an addition! The only thing missing is a few friends and a drum corps to bring the pages to life! It’s a musical journey well worth taking. A Musical Mystery Tour that you may have to take a few times to fully appreciate the undeniable talent and creativity of the composer. If one suite is not to your taste, try another! Myself, I have a suite tooth and looking forward to another bag!